Welcome to Swedish Coppers, a website about the copper coinage of Sweden. The main focus of the site is a list of Swedish copper coins by type. There are also articles, links to a variety of interesting numismatic websites and a reference page with information to assist the collector of Swedish coppers. It is a work in progress that started in December 2013. This was the money she had with her when the ship sank. On August 10, 1628, when the Swedish warship Vasa set sail on its maiden voyage, one of the passengers was a woman. About 1,300 meters into the journey it foundered and sank just outside the Stockholm harbor. It was recovered in the 1960's and now resides in the Vasa Museum. One of the exhibits is the possessions of a woman found in the wreck. It includes mittens, boots, hair brush, other personal effects and her money. She had a total of 31 Öre. As can be seen in the picture most of the coins are klippes. This makes sense as the klippes had been made from 1624 to 1626. In 1627 the change was made to round copper coins. This find is a snapshot in time of the mix of currency in use in 1628. Note that there are no silver coins. This is consistent with the governments promotion of copper as the primary domestic currency. This numismatic curiousity was part of a presentation I worked up for a HVNS meeting and also presented at PANS. It was a numis-travelogue covering the numismatic high points of a week in Sweden last summer. 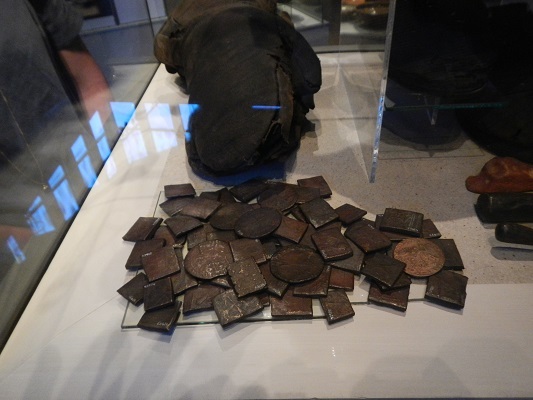 Trips to Kungliga Myntkabinettet and Falu Gruva were expected numismatic highpoints but the coppers from the Vasa were an unexpected treat. Look around the site. I have extended the types shown to include the copper coins of Gustav V, Gustav VI and Carl XVI Gustaf, added numerous type coin examples, a Battle of Lund medal, started a page on plate money and updated links and other miscellany. Could he have imagined? Would he be surprised? One of my great-grandfathers, Carl Anderson, drew this scene in Dalarna, Sweden more than 120 years ago. Now it's posted on the internet. He was a photographer in the late 19th century. Clearly, an early adopter of technology. He emigrated to the U.S. in 1907 and went back to Sweden to get my great-grandmother a few years later. That's part of my maternal geneological connection to Sweden, there's more on my fathers side. They were part of the millions that came out of Sweden and into the melting pot in those years. Anyway, I think he would have appreciated the posting of his work to the WWW. 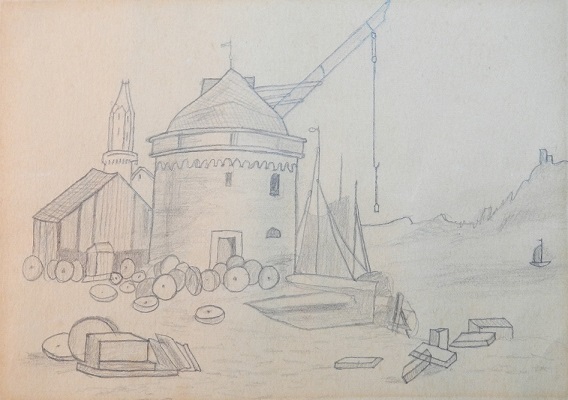 You can see some of Carl's drawings and photos from Sweden in the late 19th and early 20th on the about page. 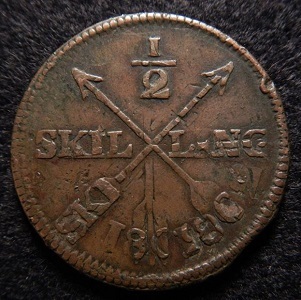 Folks like Early American Copper coins. They're a part of our national history and people feel a connection to that through the coins. They have a rich numismatic tradition too. Volumes upon volumes are available on the subject. It has been studied in excruciating detail. This is useful to the collector and lends more to the breadth of the pursuit than the historic appeal. Holding an early cent may cause me to ponder those earlier periods of our history. But is it my history? Who may have held it? No one I am related to. It occured to me one day that my personal history lie elsewhere, geneologically speaking. What coins did my ancestors use??? This is what has led to my pursuit of Swedish Coppers. A numismatic journey through times and places that have some relevance to me. I'm back at it, trying to fill holes in the type set, both the website and real versions. Per the former, I have added the coins of Frederick I. Per the latter, here's a piece the I just got from TomTrade, an auction seller in Kista, Sweden. 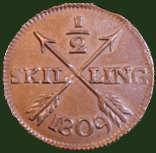 Early 1/2 Skillings (1802-05) were struck over 1 Öre S.M. coins at the Stockholm mint and on fresh planchets at the Avesta mint. The Stockholm 1/2 Skillings are often seen with significant parts of the undertype coin showing through. This coin is different though. It was minted in Avesta as can be seen by a comparison of crown types on the obverse. Thus it was made on a fresh planchet and none of the design is attributable to an undertype. It is a 1/2 Skilling that was struck twice, the second strike being 45 degrees from the first. This can be most apparently seen in the "SKI" in the fletchings of the arrow at 7:00. Recently, I gave a lecture titled Early Swedish Coppers at the Michigan State Numismatic Society spring show. Sadly, attendence was sparse. It seems the organizers felt the basic listing in the schedule of events in the 10 page convention guide would be sufficient to lure the coin hungry, bourse crowding hoards to realize they could take a break from their hunt to avail themselves of the numismatic luminations. To boot, the lecture rooms were tucked in the back corner behind the doors that said not to go past unless you were registered (what ever that is). I had fun nonetheless and was thrilled to count Reg and Ernie, a couple of HVNS guys, and Bill A. among the audience. I know Bill has some Swede in him and is a copper fan to boot. Here's the presentation. It looks like spring may be just around the corner. 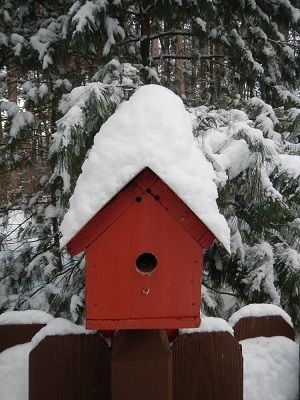 Finally, after 90 inches of snow. For me, numismatics is a seasonal sport. I dabble in the off season but there are so many more things to do when its warm. I hope to continue frequent work here though. It's been a harsh winter around these parts, one to be endured in many ways. But we should not let it pass without taking up what it has to offer. This page is perpetually under construction. Please return at a later date to view new content. Please direct any comments or questions to mkj@swedishcoppers.com .